The Epson Discproducer PP-50 is equipped for low volume CD, DVD & DL DVD production. Like it's big brother (Epson PP-100). The Epson PP-50 is an enclosed system. It has one single recorder and the same inbuilt, full colour inkjet printer. This means the Epson PP50 still produces the same quality of print and recording as the PP-100 and is still one of the easiest systems to setup and use. If you need multiple job queuing with high quality print and you're doing lots of small quantity duplication then this is a great place to start..
Offering an ideal combination of quality and economy, the Discproducer PP-50 delivers accurate burning and photo-realistic printing with a low cost per unit. 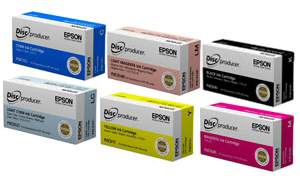 Thanks to Epson’s individual inks system, the cost of each produced media is low as you only need to replace the colour used and, depending on the print image, you can produce over 1,000 fully covered discs from one set of cartridges. The Discproducer PP-50 automatically stops printing until it’s replaced to avoid mis-prints. 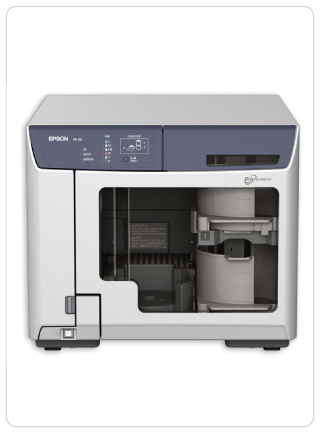 The Epson Discproducer PP-50 has a compact footprint and measures only 38cm wide to fit easily onto a shelf or desktop. Handisc offer a range of support levels to ensure peace of mind. The Epson Discproducer PP-50 comes with 1 years on-site warranty but this can be upgraded to a 3 year or 5 year onsite agreement when the system is bought. Handisc has a recently launched an Epson Discproducer PP-100 Microsite. To visit this site please select the following link. This site is designed to deliver all you need to know about the Epson discproducer PP-100 & PP-50 range. From a complete video walk through to spec, consumables and advice on getting the most out of your duplicator.